Slovenia is situated in the heart of Europe where the Alps meet the Mediterranean Sea, and the solutional relief transitions into the Pannonian plain. This small, forested country has a total territory of 20,273 sq. km, and is inhabited by kind-hearted and hard-working people. Slovenia is immensely proud of its talented athletes and rich cultural heritage. Plus, it’s always easy to compare prices on Slovenian products and services, as everything here is in one of the most stable currencies in the world – the Euro. The country’s population totals two million people, the majority of whom are ethnically Slovenian. The largest groups of ethnic minorities are residents of ex-Yugoslavian republics, though altogether they make up less than 10% of the total population. Yet despite their small size, Italian and Hungarian communities are protected by the Government. Most Slovenians live in urbanized cities, though the country’s rural area is quite densely populated as well. However, only a small percentage of the population works in the agricultural industry. Most Slovenians work in the industrial production sector and service industry. Thanks to the diligence and commitments of its residents, Slovenia is now one of the most developed countries in the EU. Slovenians as a people strive towards self-perfection and self-realization, thanks to which many of them have successfully attained success on a global level. This is made especially clear by Slovenian athletes practicing extreme disciplines like mountain climbing, extreme mountain skiing, and cycling and swimming ultra-marathons. Slovenians start learning foreign languages at an early age, and know how to master them in such a quick way that tourists never have any problems communicating with them. The majority of Slovenians know English as their second language, but German is also popular, albeit not as widely spoken. A lot of Slovenians are also familiar with the languages of ex-Yugoslavian republics, while in the regions bordering Italy, the locals can speak fluent Italian as well. At the conjunction of two geographical regions of Europe, the landscape transforms into a stunning relief covered in thick forests. Over one-third of Slovenian territory is officially protected by the state. The most mountainous region of Slovenia is situated in the north of the country, at the tail end of the Alps. The Julijske Alpe and Kamniško-Savinjske Alpe ridges are best known for their sharp, angular forms, while the peaks of Karavanke ridge on the border with Austria have a more rounded shape. Mountains make up the majority of Eastern Slovenia between the cities of Maribor and Ljubljana, and stretch out southwest of the Slovenian capital. The southwest of Slovenia is a hilly country perfectly suitable for growing grapes. Multiple mountains and hills surround the plains and valleys, in the largest of which Ljubljana is nestled together with its suburbs. In the east, the mountains continue down to the vast Pannonian plain. The underground world of Slovenia is also amazing in its own right, boasting more than nine thousand solutional caves, many of which are unmatched in beauty throughout the world. One of your first impressions in Slovenia will undoubtedly be amazement at its diverse natural landscapes. Driving around Slovenia, it might even feel like you’ve been passing through several different countries. Here, nature mixes and matches a whole palette of various landscapes in just one small corner of Europe. Powerful Alpine peaks and steep slopes, deep caves and wells, smooth hills and plains: everything finds a natural home in Slovenia. Here you can enjoy views of picturesque lakes and swift-flowing creeks, serene forests and the soft whisper of the sea. To change to a more scientific tone, Slovenia lies at the meeting point between the Alpine and Mediterranean regions, and the Pannonian plain and Dinaric Alps. Each of these regions leaves its own unique mark on the canvas of Slovenian landscapes. Green is the prevailing color throughout Slovenia. Forests occupy almost 60% of its territory, and areas of ancient growth forests can be found in the south. The sunny slopes of the multitudinous hills of the winemaking regions are covered with vineries. Although the most fertile lands are used for agriculture, it is still not difficult to find pristine, untapped meadows in the countries many valleys. The majority of Slovenia is covered with hills and mountains, especially in the north along the Austrian border. The ridges of Julijske Alpe, Karavanke and Kamniško-Savinjske Alpe stretch from the east to the west. Julijske Alpe is also home to Slovenia’s highest peak, Triglav mountain, while the foot of Kamniško-Savinjske Alpe is just a short 30-min drive from Ljubljana. Each one of the mountain systems mentioned here feature peaks over 2,000-meters high. The 1,500-meter high Pohorje mountains are situated in the east. There are also huge mountain groups to the east and west of Ljubljana. The Slovenian riviera is not so large as in other countries, but has exceptional variation. Here one can visit the famous Sečoveljske salt basins (Sečoveljske soline), and amazingly well-preserved medieval cities such as Piran. From the Adriatic coast, the Slovene Istrian hills carve deep into the country. Hills are also a characteristic feature of the southeastern part of the country, creating the perfect environment for vineries. Plains, lowlands, valleys and solutional grounds make up a large part of Slovenia’s natural features. Plains are found mostly in the northwest of Slovenia, where the Pannonian plain begins. The country’s most expansive lowland forms the basin for Slovenia’s capital, Ljubljana. Celjska kotlina is also known for its massive size. Slovenia’s underground world is also extremely rich in variation. Thousands of solutional caves can be found in the depths of the Kras plateau. More than one-third of Slovenia’s territory is part of the Natura 200 European network protecting biodiversity. Multiple nature parks and the country’s only national park, Triglavski narodni park, are protected areas as well. The variety of Slovenia’s landscapes is complemented by its aquatic treasures. Slovenia boasts some of the richest variety of water resources in any European country. Its numerous creeks, rivers and lakes still preserve their crystal clearness. All the natural wonders of Slovenia enumerated here provide fantastic resources for «active» leisure time. In the morning, one can ski in an Alpine resort, take a midday walk along the Adriatic seashore or enjoy the thermal springs in the east of Slovenia, then spend the evening at one of the numerous cultural events at the complete opposite end of the country. Regardless of such a packed schedule, you’ll still always have time to get a taste of the national cuisine. Spending a day-off in Slovenia like this isn’t just possible in theory: people do it all the time! For example, it takes less than a two-hour drive from the sea port of Koper to the city of Jesenice in the north. Plus, it’s no more than 3 hours in a car to make it from Koper to the most northeastern part of Slovenia, Murska Sobota. Slovenia’s GDP per capita in 2014 – $24,019 – 34th in the world (to compare, Russia – $12,925, Ukraine – $3,054). 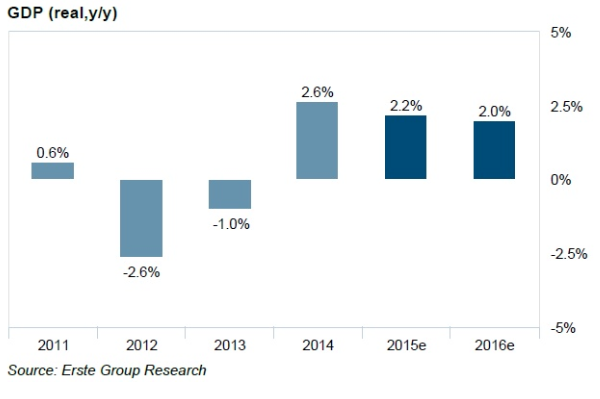 GDP growth in 2015 – 2.2%. Business opportunities are waiting for you in Slovenia! We offer free business consultations to help you every step of the way. What are you interested in? Slovenia is blessed with its unique geographical position. It is situated in the south of Central Europe, north of the Mediterranean. Slovenia is part of the European Union and Euro zone, neighboring Italy, Austria, Hungary and Croatia. Slovenia is a European country with a Slavic heart, as it was an essential part of the former Yugoslavia. If you’re looking to expand your business in Europe, Slovenia is a perfect place to headquarter your company’s European branch. In Slovenia, you’ll find plenty of opportunities for your business. Tourism is one of the most promising sectors of the country, as Slovenia’s natural assets are as stunningly wild as they are beautiful. Thermal resorts, hotels and other tourist attractions have an immense, and as of yet not fully realized, potential. Visionaries are always welcome here. But investors are also attracted to other sectors, such as the metal-working industry, automotive manufacturing and spare parts production, manufacturing of special compound materials for the sea and aviation industries, renewable energy production (solar, wind and water), the service industry and others. Slovenia is a country with a well-ordered business environment, and we’re here to help if you ever decide to open your own company here. We’ll professionally support all necessary procedures, ensuring the process is both fast and easy. Our team of specialists is trained to provide a full range of corporate services. We can help support the process of establishing your company, as well as its purchase or sale. We can offer you professional consultations on business, taxation, legal, and other issues, as well as high-quality accounting services. You can be confident to trust us in managing your company and projects in Slovenia, as our professionals always make sure your endeavors succeed. If you are looking for investment opportunities, we will carefully research the market and hand-pick the most interesting projects for you. Slovenia is a great country for foreign investment, thanks mainly to its geographic position at the intersection of traditional trade routes, as well as its infrastructure and plans for further development. After the global economic crisis, which had a notable impact on Slovenia, the country’s economy has since been growing. Slovenia boasts the following advantages: the transparent activity of legislative authorities, referendums on complicated issues, developed public procurement procedures and an overall absence of obstacles to commercial activities. Traditionally, its strong international ties and multimodal transportation system spanning land, maritime and air transport have been ideal conditions for investors interested in developing their business in the heart of a 500-million person European market. The fantastic combination of experienced foreign management and a qualified local workforce is yet another key factor of Slovenia’s attractiveness for foreign investments. A developed state system of business support, constant simplification of bureaucratic procedures, protections of creditor rights, and many other factors also speak volumes for Slovenia’s high potential. Utilities can differ greatly depending on the accommodation type. The highest costs are typically associated with the heating season. In Slovenia, fuel prices are the same at all gas stations, and are changed every two weeks. In March 2016, the average gross wage in Slovenia totaled EUR 1,593.27. An employee’s gross wage stipulated in the labor agreement includes social contributions and the income tax. Employers must compensate meals and transportation costs. The company’s total expenses on this gross wage instead total EUR 1,849.79. Transport expenses include the transportation of an employee to their workplace and back by car or public transport. For taxation purposes, the drive from home to work in one’s own car costs 0.18 cents per kilometer. The cost of business travel is instead EUR 0.37. Income tax is not paid on these sums. The average net wage amounts to EUR 1,033.95. Net wage is the wage after taxes and contributions. In 2016, the minimum gross wage in Slovenia totalled EUR 790.73. In Slovenia, wages for the previous month are paid before the 18th of the following month. In Slovenia, pensions are divided into old-age pensions, disability pensions, survivor pensions and family pensions. In 2015, the average old-age pension in Slovenia totalled EUR 613.74. Insured individuals can receive old-age retirement pension on a number of conditions. For men, these conditions are: the retirement age of 59 with a 40-year insurance history, or the retirement age of 65 with a minimum 15-year insurance history. For women, these conditions are: the retirement age of 59 with an obligatory work history of 39 years. The shorter the insurance history, the higher the retirement age level – 63 years with 20 years of work and up to 65 years with at least 15 years of insurance history. However, retirement age limits can be reduced: if the individual has children – from 6 months for one child and up to 48 months for five children and more; in the event of military service – by two thirds of the service period; if work experience was accumulated before reaching legal adulthood at the age of 18; in the event of hazardous employment. The pension calculation base is 10 years of an individual’s successful work experience. If you require more detailed information, please contact our consultants. Families with children living in Slovenia can submit a child allowance application to Center za socialno delo (the Social Work Center). A child allowance is a sum paid by the state for each child on a monthly basis in order to provide social support for families with children. Child allowance applications can be submitted in the Social Work Center (Center za socialno delo) at your registered address in Slovenia. If you have several temporary registered residences in Slovenia, then choose the one where you spend the most time. Subvention is provided to parents whose children attend public kindergartens, private kindergartens with a state program or private kindergartens financed from the municipal budget. Parents with two or more children that attend kindergarten pay 30% of the full price for the younger child, while every other child of theirs attends kindergarten for free. The application for child allowance and kindergarten subventioning is a single application submitted to the Social Work Center (Center za socialno delo) at your place of residence in Slovenia. Health insurance provides medical help and social care for the period of illness or trauma, covering medical service expenses in the event of illness, trauma or any other emergency health situations. As part of this health insurance, the rights of every individual and their dependent family members are connected with making health insurance and paying all associated taxes (for compulsory health insurance) or insurance contributions (for voluntary health insurance). If you cannot register with the status of an insured person within compulsory health insurance, you can ask insurance agencies for possible additional programs. In medical institutions, an insured person is identified via a plastic medical card that contains information on their health insurance coverage. It is necessary to make an appointment beforehand and chose a medical institution that is closest to your place of living. Foreign citizens without Slovenian health insurance have the right to receive healthcare in emergency situations; in such cases, medical services are paid in accordance with European Legal Norms and the international agreements of the state budget. Primary and Secondary School. Primary and secondary education for children and teenagers is free. Primary and Secondary School programs are compulsory and last for 9 years. General secondary schools (gymnasiums), the program of which last four years and end with graduation exams in the form of a state out-of-school assessment of knowledge, also provide opportunities to enroll in a university. Professional, vocational and technical secondary school, the programs of which are 2-5 years long and prepare students for professional jobs. They are completed with graduation exams based on the selected speciality; after successfully passing them, students have the opportunity to continue their education in professional colleges and universities. Higher education includes education in universities, faculties, art academies, colleges, independent higher educational institutions, etc. Slovenian universities are located in Ljubljana, Maribor, Koper and Nova Gorica. You can find more information on programs and admission terms on the website of the Ministry of Higher Education, Science, and Technology (Ministrstva za visoko šolstvo, znanost in tehnologijo). Click the following link for more information on education in the Republic of Slovenia. Most festivals are held in summer and spring. * Easter Monday – this date is not fixed, but typically it falls in late March/early April, after Easter Sunday. Remember that on holidays, public institutions are closed, while stores are open till 12 or 1 PM, and large shopping centers – till 3 PM. If the holiday is on a weekend, it is not transferred to the following work day, unlike what typically happens in the Russian Federation. Before the last day of the month following the quarter – the VAT statement submission for quarterly payers. There are also other important days that need to be observed depending on each company’s activity type. Our English speaking accountant will be happy to consult with you on the requirements for organizations from various public authorities, and will ensure the submission of your company’s statements so they are completed both properly and on time. We’ve been living in Slovenia for a bit more than three years, and we can’t stop thinking that this place is something like out of a fairy tale. The nature here is stunning – the sea, mountains, forests and meadows – everything is close and easily accessible. Like any resident of a large city, we appreciate a quiet, clean, calm and peaceful environment. Our daughter was born in Slovenia. We were pleasantly surprised with the level of healthcare and special care of doctors and nurses. Despite our poor knowledge of Slovenian at the time, everyone went out of their way to understand and help us. Another advantage is the ideal conditions for doing business: all the state departments work in a very precise and efficient manner, the legislative base is logical and clear, the level of bureaucracy is low, and the staff in all the agencies communicate in a very open and friendly manner. It wasn’t an easy decision to start a business in a foreign country, but we’ve never regretted it since! It’s been a bit more than a year since we moved to Slovenia, and with each passing day we’re more and more confident we made the right choice! We fell in love with this country at first sight, and this love grows stronger every day. Slovenia is an amazing country for a comfortable and safe lifestyle, which is hugely important for parents. It has an excellent climate and natural features, and the nature here is stunning. Anyone can pick exactly where they want to live: in the capital, the mountains, or by the sea. It’s hard to even list all the various benefits of living in Slovenia, like its natural and high-quality food, modern and comfortable transport, and high level of education. But I’d also like to emphasize how friendly and tolerant Slovenians are – it’s like they don’t have a single prejudice towards foreigners! Hi! We’re the Umnovs – Vika the mom, Zhenya the dad, our daughter Polina and Yudzhi the dog. We’ve been living in Ljubljana for a bit less than a year, but even this limited time has been enough for us to experience the many advantages of life in Slovenia. This includes everything we’ve come in contact with so far, like the economic climate, calm political atmosphere, Ljubljana’s amazing infrastructure, breathtaking natural features and the availability of all the beauty of the Balkans, Italy, Austria, Germany and other European countries that are only a 1.5-hour drive away, the affordable European education for our children, and an amazing reason to study new languages, cultures and traditions. Indeed, the language turned out to be a huge problem for us (right after we moved, of course). Our daughter, who was integrated immediately in school thanks to her class work (and the Slovenian school teachers) and daily communication with other children, now knows Slovenian much better than her parents. But we are using all the available opportunities to learn the language as well, from attending special club meetings where immigrants can have informal conversations with native speakers, to free language courses for immigrants or parents of school children. Our daughter is in the 4th grade and attends gymnastics classes, which makes it easy see all the effort and funds the government invests in education and sports. Every weekend or time off we have from work we visit a new picturesque place to relax and focus on our future goals. Thanks to all this, Slovenia now feels like home, and we don’t regret our decision to move here one bit.